Pour 1/3 cup of the dressing over vegetables. Cover and refrigerate 1 hour. Heat coals or gas grill for direct heat. Drain vegetables, reserving marinade. Thread vegetables on each of eight 10-inch metal skewers. Brush with marinade. Cover and grill vegetables 4 to 6 inches from medium heat 15 to 20 minutes, turning and brushing twice with marinade, until crisp-tender. 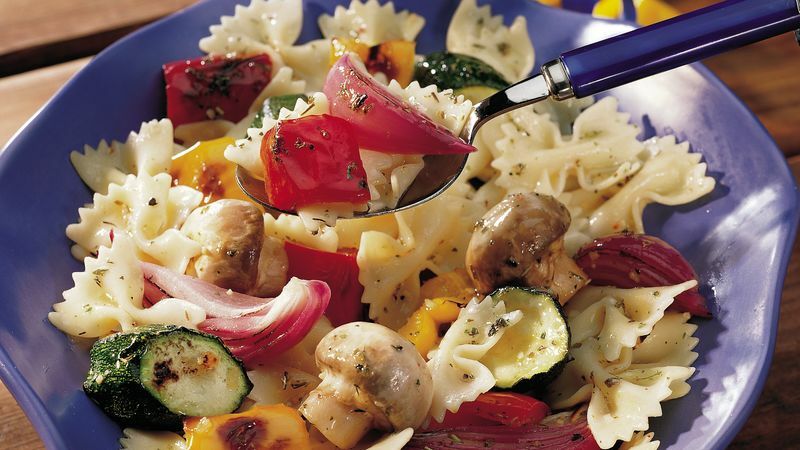 While vegetables are grilling, cook and drain pasta as directed on package. Remove vegetables from skewers. Toss vegetables, pasta and remaining 1/3 cup dressing, adding additional dressing if desired. You’ll have the prep done in no time when you buy precut fresh veggies at a pay-by-the-pound salad bar. Make it a main dish by tossing with grilled chicken or pork.